Compelling documentary that follows inventor Tim Jenison as he tries to reveal the tools and techniques used by Vermeer to create his life-like works of art 150 years before the invention of photography. Jenison's wildly ambitious quest stretches across the globe and culminates with his attempt at recreating Vermeer's masterpiece, 'The Music Lesson.' In the process something magical happens. CULVER CITY, Calif. (April 21, 2014) � Discover the mystery behind Johannes Vermeer's photo-realistic paintings on June 10, when Sony Pictures Home Entertainment releases Tim's Vermeer on Blu-ray(tm) Combo Pack* and Digital. An official selection at the Telluride, Toronto International and New York Film Festivals, Tim's Vermeer is a compelling documentary that follows inventor Tim Jenison as he tries to reveal the tools and techniques used by Vermeer to create his life-like works of art 150 years before the invention of photography. Jenison's wildly ambitious quest stretches across the globe and culminates with his attempt at recreating Vermeer's masterpiece, "The Music Lesson." In the process something magical happens. Rolling Stone's Peter Travers raves, it's "a stimulating detective story that holds you in thrall." 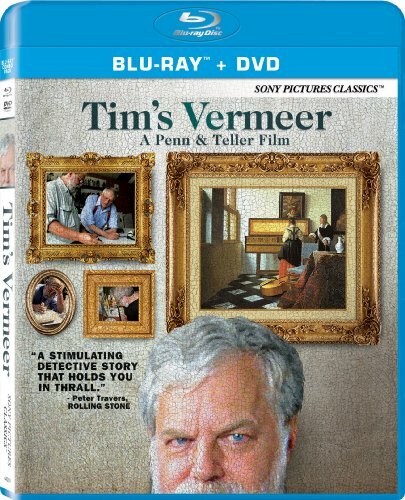 Available on the Tim's Vermeer Blu-ray Combo Pack is more than two and a half hours of deleted, extended and alternate scenes, as well as commentary with Teller, Jenison, Penn Jillette & Farley Ziegler, and a special "Toronto International Film Festival Q&A" showcasing the film's talented team. The film was written by magician-duo Penn Jillette & Teller, directed by Teller, and produced and narrated by Penn Jillette. Featured in the film, in addition to Jenison, is English artist David Hockney and actor-painter Martin Mull. Tim Jenison, a Texas-based inventor, attempts to solve one of the greatest mysteries in the art world: How did Dutch master Johannes Vermeer manage to paint so photo-realistically 150 years before the invention of photography? Spanning a decade, Jenison's adventure takes him to Holland, on a pilgrimage to the North coast of Yorkshire to meet artist David Hockney, and eventually even to Buckingham Palace. The epic research project Jenison embarks on is as extraordinary as what he discovers. Tim's Vermeer has a runtime of approximately 80 minutes and is rated PG-13 for some strong language.